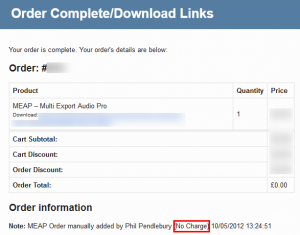 Past orders are currently being added for existing MEAP users. This is a slow process as there is no automatic way to do this. I have written a script that takes care of the hard work but each form must be filled in manually and submitted. I estimate it will be finished by approximately 20:00 GMT 0n May 07 (2012). Existing users may have received an email (similar to below) when your order has been added to the new system. Existing users may now log in and download MEAP from the My Account section of the website. 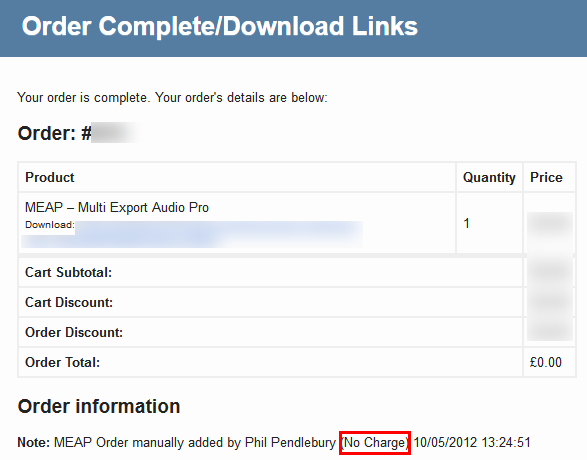 Please note that you have not been charged for this order, you are simply being added to the new system. MEAP has absolutely no way of charging anyone’s Credit Card or PayPal account without their explicit permission. This routine simply enables you to download any future version of MEAP when released. I have now suppressed these emails completely to avoid alarm. However, once the process is complete, existing users will be able to login as mentioned above and download the current and any future versions of MEAP. Previous post: Is there a trial or demo version of MEAP? Next post: Should I run MEAP as an administrator? If so – How?